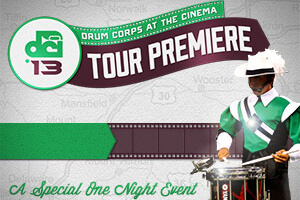 Drum Corps International's first cinema event of 2013 is just days away! On Monday, June 24, the DCI Tour Premiere will be shown in more than 450 theaters nationwide, bringing you performances of six of DCI's top World Class corps, filmed live in Akron, Ohio on Saturday, June 22. Don't miss viewing the 2013 productions of the Phantom Regiment, Cavaliers, Spirit of Atlanta, Cadets, Boston Crusaders and Bluecoats in their entirety, as they begin their 2013 summer tours. The event will also include an overview of the entire 53-day summer tour, along with other highlights including a first-look at DCI's newest performance opportunity, DrumLine Battle! Tickets are selling fast, so avoid running the risk of your local theater selling out by ordering yours in advance online. Find a theater near you and order your tickets through FathomEvents.com. Order your tickets today and bring your friends, family, coworkers and drum corps pals to this special one-night-event on Monday, June 24. Also, don't forget to enter the Drum Corps at the Cinema sweepstakes, presented by DCI and Fathom Events, for a chance to win tickets to the 10th edition of DCI's "Big, Loud & Live" cinema event on Thursday, Aug. 8, and gift cards to DCIstore.org.